The Miller® Bobcat® 225 is a 225 amp AC/DC welder and 11,000 watt generator. The 225 is powered by a twein cylinder Kohler 23.5 horse power gasoline engine and has a 12 gallon fuel capacity for longer run times. The Bobcat 225 provides both CC and CV welding output, which means your can MIG, TIG and stick weld, with the proper accessories. The redesigned Miller Bobcat 225 is quieter to operate, smaller and lighter and easier to maintain than previous models. It comes complete with Miller's True Blue® 3 year warranty. Quieter and Better Sound - Significant improvements in sound level and quality offer better jobsite communication, which provides a safer, more efficient working environment for you and your crew. New Bobcat 225 welder/generators have rotated the engine toward the front to create more efficient airflow, resulting in significantly quieter operation. Now you can start your job earlier in the day and end it later, as well as work around hospitals, businesses, and residential areas. Smaller and Lighter Design - New Bobcat 225 welder/generators take up less space on trucks and trailers - leaving more room on your truck for other equipment and tools. Plus, they're easier to move safely around jobsites - even with weld cables and running gear attached. Long Runtimes - Large 12-gallon fuel capacity means many hours of run time before refueling. Versatile AC and DC Weld Output - Provides quality welds on all types of metals. DC is smooth and easy to run while AC Stick is used when arc blow occurs. Accu-Rated™, Not Inflated Generator Power - Miller's Accu-Rated™ 11,000 watts of usable peak power is delivered for a minimum of 30 seconds. Accu-Rated means peak power is usable for maximum generator loads such as plasma cutting, Millermatic® MIG welders and motor starting. Accu-Rated peak power beats the competition's very short duration peak or surge power. Use your peak power, it is more than a number. Smooth Power, Not Spike Power - Revolutionary ten-degree skewed-rotor design optimizes generator performance for smoother power, not spiked power found with other brands. Better power, better performance. Mandatory when operating on California grasslands, brush, or forest-covered land and all National Forests. For Bobcat 225, Bobcat 250 & Bobcat 3 Phase welders Mfg AFTER January 2012. Miller Bobcat 225 907498001 does not have remote control capability. Does the welder have a 120 or 220 volt plug in for plain power? Miller advises that the Miller Bobcat 225 907498001 will run the Dynasty 300 only up to about 200 amps. To get the maximum performance from the Dynasty 300 you would have to use a 15,000 watt diesel generator. Miller Bobcat 225 907498001 will run your 210 mig welder. Does it come with everything ( leads) ready to weld? No, this will include the Engine Drive only. Everything else would need to be purchased separately. I live in Mississippi. Will I pay sales tax? Thanks! Cyberweld is only required to charge sales tax to orders shipping to Arizona or New Jersey. Therefore, no sales tax will be applied to your order. what is the GFCI stand for and what does it do? How long does it take from the time I order to delivery? what is the difference in price of the 2 differance engines and is there a preformance differance. The Miller Bobcat 225 Welder 907498001 is not a good choice as a tig welder but it can do Non Critical tig welding. All you would need is a tig torch and a tig torch adapter. Also I forgot to ask can u also run the multi matic 200 welder off this machine and be able to use all the features. The Miller Bobcat 225 Welder 907498001 and the Bobcat 250 are very similar in there capabilities but you can consider the 250 a heavier duty machine. The 250 can produce up to 250amps DC welding current versus 225 amps for the 225. Because of this the Bobcat 225 is not recommended for carbon arc gouging .The 250 can produce 250 amps AC welding current versus 150 amps for the 225.Both models produce 1100 watts peak generator power and 9500 watts continuous generator power. Both models use the same engine and are physically the same size. The Bobcat 250 weighs 16 lbs more than the 225. and it is slightly quieter. So you can plug a Millermatic 140 190 211 and so on into the bobcat 225. But can you use all the heat range's from say 22 Gage to 3/8 or is it just weld hot or go home. In one of the ask and answer blocks, someone asks if you can air carbon arc with the 225. Someone answered with a no you cannot, yet in the application section it states that you can? Im just wondering what that is all about. Could you carbon arc with the bobcat 225 ? will there b a rebate on the bobcat 225 anytime soon? what is the difference in quality between the miller and Hobart machines? The Miller Bobcat 225 Welder 907498001 is a Constant Current /Constant Voltage welder. it can be used for stick, mig and non critical tig welding. The Hobart Champion Elite Welder 500562 is a Constant Current welder only . It can be used for stick or non critical tig welding.. You cannot use it as a mig welding power source. 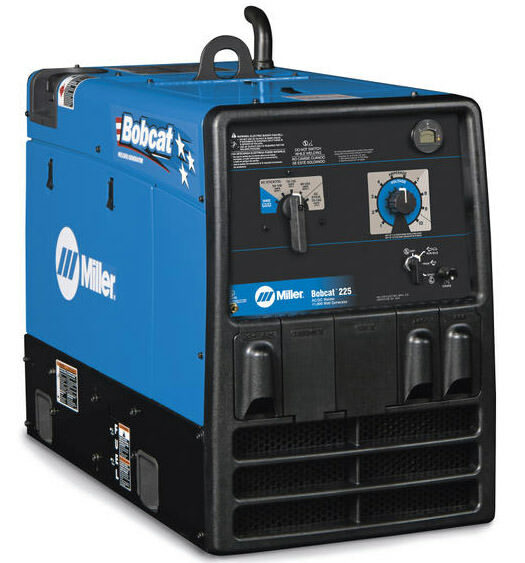 The Miller Bobcat 225 Welder 907498001 produces 9500 watts of continuous auxiliary power. It can be used as an emergency generator for your house as long as you do not exceed the its 9500 watt capability. you have to cover this machine frome the rain? You do not have to cover the Miller Bobcat 225 Welder 907498001 to protect it from rain and weather. If you are in Atlanta Ga and you purchase the Miller Bobcat 225 Welder 907498001 for shipment to Georgia you will not have to pay sales tax. The Miller Bobcat 225 Welder 907498001 can be used to mig or tig wld aluminum but it is not a good choice to do so. To mig weld aluminum with the 225 you will need to add a spoolgun like the Miller 30A or 15A plus a WC115A weld control. Or if you are only doing light gauge aluminum you can use the Miller 3035 spoolgun plus a SGA 100C weld control. You can do non critical aluminum tig weld with the 225. You will need a HF 251high frequency arc starter. . The 225 does not have remote amperage control capability so you will not be able to use a footpedal control or hand remote control. There is no rebate offer on the Miller Bobcat 225 Welder 907498001 . Miller indicates that you can run a grinder while welding with a Miller Bobcat 225 Welder 907498001 or a Bobcat 250.. You may have to compensate for the grinder load by adjusting the weld output..
how many plugs dose this machine have? What is the Max steel thickness that this welder can weld on a single pass? What is the Max stick thickness can be used with this welder? Miller indicates that without knowing the joint configuration it will be hard to give and exact answer to your question regarding how thick can the Miller Bobcat 225 Welder 907498001 weld in a single pass. They feel it is capable of welding between 3/8" and 1/2" steel depending on the joint design and configuration. The largest stick electrode that the Miller Bobcat 225 Welder 907498001 will run properly is 5/32"
Is the Bobcat 225 no longer available with AC welding option ??!! I want to buy this machine but I don't see AC. I need AC for ranch welding structural pipe that creates arc blowback. The Miller Bobcat 225 Welder 907498001 is brand new. Below the picture of the machine you will find a button labeled accessories . Click on this button and you will see the most common accessories used with this machine . One accessory that you will most likely need are the welding cables.. Does the Bobcat 225 welder come with the Subaru engine at the price listed of $3,430.00? What do I need to Tig weld with this machine? Can this be delivered to a residential address? 1.. Is this a new brand product ? 2 what year is this product? Will this generate 3-phase power? Or can it be adapted to do so? I would like to move a pivot irrigation system. Why doesn't it low idle? can you heli-arc with this machine using a foot control? You can tig weld with a Miller Bobcat 225 Welder 907498001 however there is no provisions for using a remote control such as a footpedal..
will this welder power a Miller Spectrum 875 Plasma Cutter 907390011 ? Miller Bobcat 225 Welder 907498001 will power a Miller Spectrum 875. The Miller Bobcat 225 Welder 907498001 can weld aluminum using a spoolgun..If you plan to weld aluminum in the 1/4" or thicker range you will need to add a 30a Spoolgun (130831.. $962.00) or a 15a Spoolgun (195156..$839.00) plus a WC 115A Control with contactor (137546.. $1004.00)..If you are planning to weld lighter gauge aluminum using up to a max of 150 amps and a max wire size of .035 you can use the 3035 Spoolgun (195016..$596.00) plus a SGA100c Control with contactor (043857..$328.00)..
Miller Bobcat 225 Welder 907498001 will put out 48 amps on the 220v auxiliary. I have a Miller Bobcat 225, Onan Performer engine driven. If i start the engine it will not run; what could be the cause? If your Miller Bobcat 225 Welder starts but will shut down after you release the ignition switch the oil pressure safety switch may be bad. This is an excellent generator/welder. Works perfectly and is very dependable. I am using it to construct livestock corals from drill pipe and premade metal panels. Runs grinders and nearly any power tool you need. We also plan to use it as a back up generator for our home when the power goes out. Delivery was included and was delivered to my home without damage and in a reasonable time frame. Thank you - Cyberweld.! Bobcat 225 is a great machine! Received machine quick after ordering, filled with gas, checked oil level, hooked up battery, and started welding. This machine welds great! I own a large farm, and it's just what I needed. A pleasant experience. Shipped item to an unusual location for me. A local feed store. It arrived promptly and the shipping company had all the paperwork in order. Great service and product. Product was shipped quickly, and I received my optional wire welder already. Staff was friendly and helpful with questions. ProsGreat price, quick ship, helpful staff. 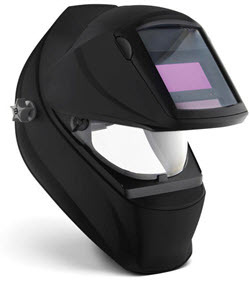 This welder is exactly what we needed and wanted at the best price we could find. Cyberweld is very efficient and prompt on their welders and will definitely use them again. Great Machine for its level and price, fired right up after checking oil and adding gas. motor runs smoothly and is much quieter than older designs. Welds nice and has good generator output. Nice upgrade from my previous Lincoln model. I was very pleased with my experience buying from Cyberweld. It was a great price and the delivery was quick and free. I am pleased with the way the unit works. Fast shipping and appears to be in good condition. Do need to purchase Leads separately. I really thought leads would be part of the package. I have work with this welder before and I like to owen one [ one day].